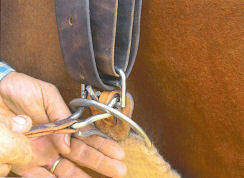 What is Cinch Hook and why is it sweeping the nation? Cinch Hook is an all stainless steel buckle that when permanently attached to your latigo (cinch strap) it makes tightening your saddle effortless, allowing you to easily tighten you saddle and keep it tight throughout your whole ride. The unique thing is the way you buckle your cinch to the stainless steel latch bar of the Cinch Hook making for the strongest most secure and advanced cinching system ever. 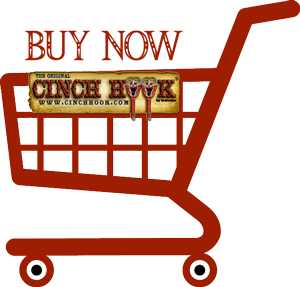 Why spend all that money on a Smart Cinch or a cinch with rollers when you can buy a Cinch Hook and keep the cinch you already have. 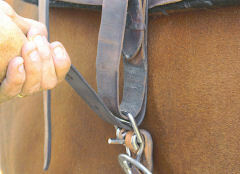 Cinch Hook is an all stainless steel buckle that is permanently attached to you latigo (cinch strap). Its unique design allows you to buckle your cinch to your latigo in a way with such strength and security never offered before in cinching. 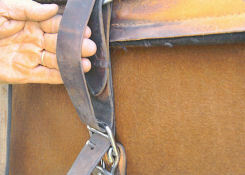 Cinch Hook has no rollers on it, so it will never catch hair and pinch horses like cinches with rollers do. Cinch Hook is the most advanced cinching system ever offered.